They tell us you can never reach the end of the rainbow because the rainbow is a little like an optical illusion. The rainbow is formed because the actual raindrops act like thousands of little prisms that refract and reflect the sunlight towards you. So when the sun combines and those millions of raindrops have this light hitting them and split the colours for your eyes to see the effect. Even when you change your position, the angles change and you see the rainbow at new angles of these little prisms. The ability to see the rainbow is that you have to be always be that certain distance away, even as you try to move towards the rainbow, it stays that distance away from you, so you can never get to the end of that rainbow. I just think for many of us, that innovation is often just like that! So it got me thinking. The rainbow never touches the ground and there is no end to it, it sort of dissipates and that also sounds just like innovation as well, we often lose the focus or the original intent in the final product. Innovation, as we know, is made up of a lot of activities, a rainbow of different often colourful activities, that need to be combined together for the end result but they do need the right conditions to produce this. Yet to gain from “this rainbow effect” of lots of ideas, like the rainbow you need to narrow the funnel of precipitation to get a desired result. Sounds a little like a narrowing innovation funnel or staying very focused. Funnily enough, like the rainbow, you think you have arrived at the end but you have actually not, in your innovation activities, to get to that pot of gold. Unfortunately the “beneficial effect” has seemingly moved on or simply disappeared so you have to continue the search for your innovation rainbow elsewhere. The one you originally saw was a while ago, conditions so quickly change and you just have to keep on adding to what you have achieved and keep searching for the perfect innovation end that seems never to come. Why, simply because you just can’t get to the end, it is always changing, something takes over, the world never stays the same and always, yes always, depending on the right conditions, you just need to keep chasing as you see a new end but it just keeps that tantalizing distance away from you. Just like the rainbow, it fascinates you, it keeps you involved and moving towards a clear target. Can we ever complete the full circle required from innovation? As rainbows are made in the sky they actually never touch the ground, you think they do but they don’t. Rainbows are actually complete circles but you never see the whole one as horizons seem to get in the way. Again I think innovation has this in common. 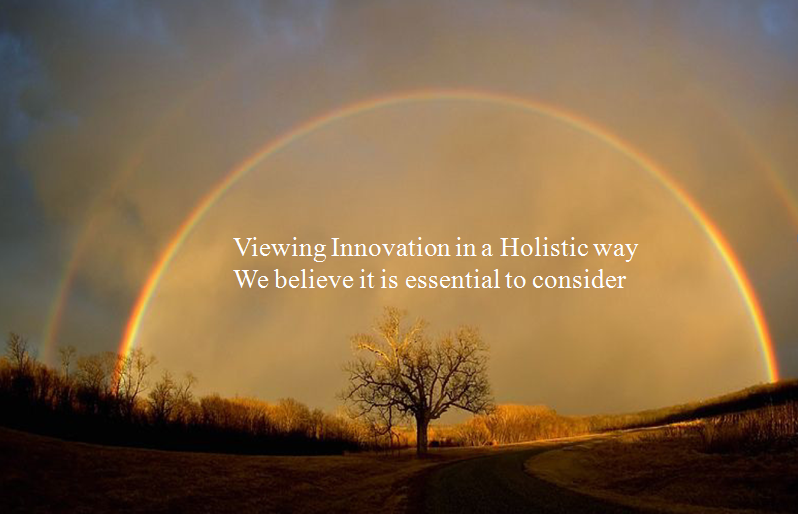 You never can achieve the “full holistic” effect of innovation we are often arguing for, as absolutely necessary, (for the pot of gold perhaps) because something always gets in the way. What we can only achieve is to urge people to rise above what they are working upon so they can appreciate the arc of innovation better, like the rainbow. The higher we can rise up, the more of the circle we can see and attempt to make all the necessary connecting points. The important point of appreciating innovation is that we all value the innovation effects differently. It is like appreciating a rainbow, when we stand in different positions we see often different effects of a rainbow, just like for innovation – no two pairs of eyes can see the same, each observer can see a slightly different rainbow, even if they are standing next to you as what makes ‘it’ up, as it is always in constant motion. The effect is different for each of us. It constantly changes, just the same as innovation – it is unique in its own way to the individual that ‘sees it’, yet we can see the rainbow effect in its own unique way, similar but different for each person but it is the same rainbow or is it? I also think innovation is made up of a broad spectrum of refractions, the passing of light (insights) from one to another and in our reflections in its activities and impact, just like rainbows. Reflective prisms are used to reflect light, in order to flip, invert, rotate, deviate or displace the (existing) light beam. This seems a little bit like brainstorm techniques. You suddenly see everything in clear, new colours. Those magical moments when you have clarity and like innovation the effect suddenly takes hold and you are amazed at the unexpected turn in events. From this point on, you ‘push’ to change the existing for something new and hopefully preferred, something that you believe gives perhaps a greater value than the existing. Is innovation an illusion – both deceptive and never-ending? So we will never reach the rainbows end, we will ever reach innovations end? Or will it always stay at a ‘respectable’ distance, just like the rainbow where innovation is also an optical illusion I wonder? Just out of reach. Just like our rainbow, it will always be a certain distance away from you and as the conditions change, you lose sight of the innovation rainbow. You can either seek it out or wait for those conditions again, perhaps like innovation, those conditions are hard to sustain, we need to keep moving, waiting for the right conditions again to get the benefit. Innovation needs the right conditions to come together, so does a rainbow. Creating those conditions is both made up of luck, being in the right place at the right time but also knowing what needs to be in place to achieve the “effect”. A rainbow needs light, water and air to produce the right atmosphere and conditions. Don’t we start looking for a rainbow when it rains and the sun shines together? Well, innovation is just the same, we need certain conditions like culture, processes, directional energy and equally all within the right environment to allow it to happen. We look for these as well. Just remember, like the rainbow there is no end to it, it just needs the right conditions. The pot of gold, well it is at the end, can’t you see it? I can – it’s all been told. This entry was posted in Molecules and tagged absorptive capacity, approaching innovation differently, creating the right conditions for innovation, Innovation Conditions, Innovation effect, right conditions for innovation. Bookmark the permalink. Thanks Kasper for this- I had not made the same connection as you, from my previous post “The separation effect required for innovation”- I’ll head back and take a look. Thanks for your reference, it is allowing and encouraging different interests that combine to make (great) innovation to happen. Paul – thanks for sharing this truly joyful, natural occurrence and innovation metaphor. I’m sat in my (innovation) office with sunlight streaming in… and now making rainbows with my glass of water, my watch and ring… a moment of magic and delight! Paul, I am currently in the UAE, and I see in the desert a lot of innovation MIRAGE! It is also very inspiring and different conditions are required to get it. You see things reflected on the asphalt like a mirror. The rainbow metaphor is very inspiring. Thanks for the comments- yes those Mirages across the deserts could all be innovations conjured up in our minds…………..